Obama and Lions don’t get on. This shouldn’t come as much of a surprise, but then again, it shouldn’t be much of a problem. Obama and I started working together in Wales, and slowly migrated to England, neither country having an obvious lion problem. But then I am not a pony. Obama is, and takes a very different view. The first lion I noticed was on the road from Glastonbury to Rode, (that has to be a song title), the first stage of my Exeter to London, wheelchair enabled vehicle trip. We came round a bend to be faced by Rodin’s “Thinker”, a rearing horse and a huge lion. Obama freaked out. At the time I wasn’t too sure whether this was because his artistic sensibilities had been outraged, a reaction to a rearing horse or fear of lions. Given the traffic on the road to Rode, and the stresses of the journey, I took a couple of photos and moved on to somewhere that Obama felt safe. Xenophon is dead right. I should have led Obama up to the offending lions, “thinkers” and concrete rearing horses, but Xenophon didn’t do his training on the UK’s rural roads. And anyway he didn’t say you should lead your horse up to something that frightened it, he said you should get your groom to lead your horse up to something that frightens it. But I digress. I made it to London without seeing any other lions. Obama would beg to differ, but I didn’t see any lions. The next lion I noticed was this spring, driving on the A272 between Newick and Piltdown, a road that only the stupid take pony drawn vehicles along. I approached the crest of the hill on the right hand side of the road, with me leading Obama from the left, and providing a human shield from the traffic. I consider this the safest way to lead on insanely busy high speed roads with no verge or footpath. If you are leading on the correct side of the road, you are permanently looking over your shoulder to assess the risks, which does nothing for the pony’s confidence. Facing the traffic, you can see the idiots, and can step further into the road to persuade them to slow down. My policy is simple, if you want to drive a car into my pony, you have to go through me first. My attention was forwards to the traffic, but Obama was keeping his eye out for danger, and as we approached a driveway, he saw a lion, and freaked. This time I know it was the lion because there weren’t any “Thinkers” or rearing horses, just a gravel drive and a stone lion. Obama was terrified and I had to take him across the road to get him past the offending lion. I came back later to take the photos, it just wasn’t an option at the time. The third lion that I noticed, again, please note this is my lion scoring system, not Obama’s, was in Exeter on the playing fields. This is a regular route of ours, so I know the usual lion population is zero but Obama again totally freaked. 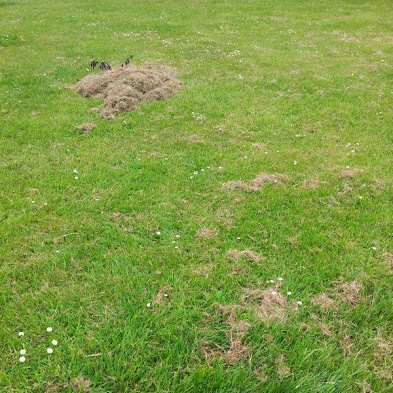 The “lion” was a pile of, admittedly lion coloured, lawn mowings, with a branch lying on the ground behind them. I do have a photo, or did till my computer crashed, showing a pile of lawnmowings and a branch that with a lot of effort can be seen as a lion’s head with the branch making some very unconvincing ears. However if I am honest, the photo very clearly shows a pile of lawnmowings and a branch, and only with prompting will you see a lion’s head. But that is the whole point. Ponies are a prey species. Horses are just over grown domesticated ponies so we can ignore them, but ponies evolved over millennia from animals that survived to breed because they could identify a predator, even when it was hiding. I believe that most problems with discipline, outside the school, come from the pony’s belief there is a lion ahead, and the rider’s conviction that the animal is naughty, or lazy, or napping, a disgusting word which is used to justify pointless abuse. From my, and Obama’s experience with lions, I believe that prey species have an innate predator identification mechanism, that cuts in above a specific probability of as predator. I believe humans are brilliant at recognising their own name in a document, ie your name has a shape that is particularly identifiable to you. It is far more important for a prey species to recognise a predator, than it is for you to recognise your name. My final lion belongs to John Bunce, his Chesapeake Bay retriever. I was over at John’s just seeing if Obama was going to co-operate driving round John’s field. He had been there before and driven with John’s big Clydesdale and a mildly loopy thoroughbred in the same field, and John’s Chesapeake had chased Obama and Obama had returned the compliment. This time, the field was awash with buttercups, chest high on a Chesapeake, and the dog was lugging a huge log around in his jaws. Obama saw a huge head and oddly sinuous body racing through the buttercups and went straight into terror mode. I pulled the ripcord, leaped out of the iBex and only just managed to keep control of Obama who was circling me at speed, eyes on stalks, ears rigid. Once a friend had caught the dog, I put Obama back in the iBex and gave it another try. Unfortunately the dog got loose again, with identical results. So we took a half hour break and I got John Bunce to drive Obama and the iBex, on the road, with the dog. No problems. Obama isn’t scared of dogs, he isn’t scared of much, but in high buttercups, a big dog looks weird, and mildly lionlike. I don’t think we should all be trying to spot the lion, for a start, we don’t respond to the same visual clues. If we did, Simon Mulholland would have you all going “Wow, I recognise that name! That’s me.” We need to accept that although we can’t see the lions, our ponies can. What riders call “napping” is fear. The cure for fear is reassurance and leadership. And leadership, as I say endlessly, is positional. Lead the animal. That is all it wants. You between it and danger. I specify outside a school, mostly because I never work animals in a school if I can possibly avoid it, and because in schools the major problem is boredom, unless your school has an unusually high lion count. Even then, a slowly turning fan, or a sound system may trigger the fear mechanism. The essential point is that fear is an innate part of a prey species survival mechanism. It is normal, and good. If you punish the normal and good, kicking the poor animal on, whipping it and hauling its head around, you won’t get the normal and good, you will get the abnormal and bad, and it will be entirely your own fault, or the fault of the person who told you to kick or hit a scared animal. It’s the same thing as a parent yanking on a child to walk passed a grave yard, even if the child is terrified of them. It hurts the child, yeah, but the parent knows that there is nothing to be afraid of, it’s just a square of dust, really, and the child ought to TRUST the parent. If my horse is afraid of something and won’t go, I’ll spur him on a little, just to find out what exactly is freaking him out. Then I work on establishing that I know better, and I am in control of him, so he should know better. If he doesn’t go forward, towards the scary object, he has to move his feet around until he does. For every step closer that he takes, he gets rewarded by a loose rein, a good neck scratch, a “Good boy!”, and no pressure on his sides. If he starts backing up, I back him around in a circle. If he’s gonna back, it’s going to be because I said so. Not because he is afraid. It works every time. He goes towards the spooky thing, sniffs it, gets a pat, and we continue on our way. My horse hardly EVER spooks now, because I have taught him that not only CAN he trust me, but he SHOULD because I am the leader and I know best. I am his leader before I am his friend, otherwise he will not give me the respect that, at my skill level, I deserve. I pop him in the face if he tries to bite me, I don’t give him a damn carrot. Do you know how stupid that is? The lead horse doesn’t give comfort towards the omega biting him, he bites him back and puts him back into his place. I am Winchester’s lead horse. He comes to me for attention, comfort, and as a result of my training, he would jump over the moon if I asked him to. The thing is, I never will, and he knows it. He knows I won’t push him passed his capabilities, so he tries his hardest for me, knowing that it is achievable. He hardly has any “lion” moments, because I taught him that those are bad manners and unless it is legitimate danger, spooking is unacceptable. Snorting, prancing, and that kind of behaviour is fine, but the second he balks or bolts, he is going to get worked, and he knows it. He trusts MY judgement more than his own. And there are times when I trust his more than mine, such as if we are on a trail and a wild dog comes crashing though the brush, and my boy bolts. I will let him bolt, because that is actual danger. Or if I am heading on a trail and he DOES NOT move for ANY reason, than there must be something there that I cannot see. Perhaps he can smell a pack of coyotes or he sees a snake. In that case, we turn around and go home. But as a result of my leadership, Winchester rarely spooks and bolts anymore. Your boy, Obama? It seems that every post, there is something he is afraid of. Listen. Bits, spurs, whips, and reprimanding are NOT violence. They are tools. They are ONLY violence in violent hands. A bit is not mean to cause pain. It is meant to act as a point of communication from the hands of a rider to the horse’s head. Mild discomfort if the horse does not accept contact, or does not turn when asked? What is violent about that? The same with spurs, or whips. People can use these aides to hurt the horse, but many people do not, and know how to use them properly. If you think that bits, spurs, and whips are evil and unnecessary, you have clearly never seen or used them properly. I assure you that both of my horses are happy, and they know that I am never going to deliberately cause them harm. They forgive me, I forgive them. They are very happy and not very spooky. Your pony is spoiled and you should be ashamed of that. Give him a carrot every time he bites you, and see how much more often he does it as a result of you encouraging such awful behavior.